In Vienna in the summer of 1927, the Social Democrats represented a local majority, but faced resistance from the federal government and many rural fascist-leaning areas. In July, a federal court found the Tscharmon brothers and Julius Pinter, members of the militaristic Front-fighters (a group opposed to the Social Democrats), not guilty for the murder of a worker and eight-year-old boy during January demonstrations by the Socialist Republican Guard. Viennese workers heard of this acquittal early in the morning on Friday, July 15, 1927. Workers left their posts, held meetings, and agreed to march on the Parliament building. From eight to nine that morning, the power station workers decided to strike and no trolleys ran in the city. 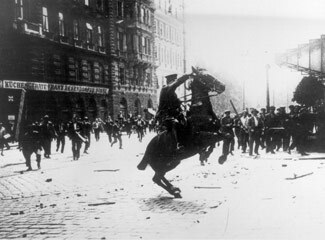 When the workers reached the Ringstrasse plaza in front of the parliament building, Chancellor Seipel ordered out mounted police. Violence erupted on both sides, and it is unclear who instigated the first attack. Police fought with sabers and revolvers and protestors began to scavenge materials from nearby construction sites to wield against the police and make barricades. At one point, it is alleged that the chief of Police ordered his men to cease, but to no avail. The workers penetrated police forces and entered the Ministry of Justice, destroying property and setting fires. Reports indicate that the fire brigade was called, but could not reach the flames due to the crowd. The national government called in militia forces and protestors and police escalated violence. Protestors attacked offices of “bourgeois” newspapers, and lit fire to the house where the acquitted had been staying. At 7pm on that Friday the Social Democratic party Executive Council and Trade Union Council called for a general strike to prevent the wild protest from ending in civil war and revolution. For one day, they demanded all workers in Vienna to stay home and quietly protest. They specifically appealed to workers not to demonstrate in the streets or clash violently with the police. During Saturday, July 16, the Social Democratic party reported that the general strike was continuing successfully and that workers should be wary of communist agitation. Stories circulated that communists had instigated the Friday riots and were urging for the arming of the working class, though when examined, actual evidence does not seem to corroborate this rumor. During the Saturday strike, six communist youth were killed, though the circumstances of their deaths are unclear. The Social Democrats Republican Guard may be implicated, though their mission for Saturday was to patrol the streets to enforce the strike and prevent violence. On Sunday, July 17, the general strike ended. News came in from rural districts that the fascist-leaning Heimwher (a militia force sympathetic with Seipel’s government) were organizing and intending to come to Vienna by rail should the communications strike continue. After requests from Graz and other regions, the Social Democrats announced at noon that the communications strike would end on Monday, July 18 at midnight. The Social Democrats then entered into conversation in a special session of Parliament to decide responsibility for the July 15 riot. During the riot police and protestors killed over 100 people and destroyed over 35 million dollars of property. The general strike was successful at preventing open civil war between the Viennese Social Democrats and the Austrian national government, and the Social Democrats actually gained votes and representation in many rural areas in the 1928 elections. Crook, Wilfrid Harris. "Vienna in 1927." The General Strike: a Study of Labor's Tragic Weapon in Theory and Practice. Chapel Hill: University of North Carolina, 1931. 586-95. Print. Lewis, Jill. "The Year of the General Strike, 1927." Fascism and the Working Class in Austria: 1918-1934 : the Failure of Labour in the First Republic. New York U.a. : Berg, 1991. 122-46. Print. Due to the incredibly brief nature of this strike, and the violent, more publicized context in which it occurred, information on the strike itself was somewhat difficult to find. Information posted here draws deeply on Wilfrid Harris Crook's "The General Strike" pages 586-595.